Commemorative stamps to celebrate the 200th anniversary of the births of Queen Victoria, Britain’s second longest-serving monarch and her husband Albert, Prince Consort, are to be released by Guernsey Post on 29 May. 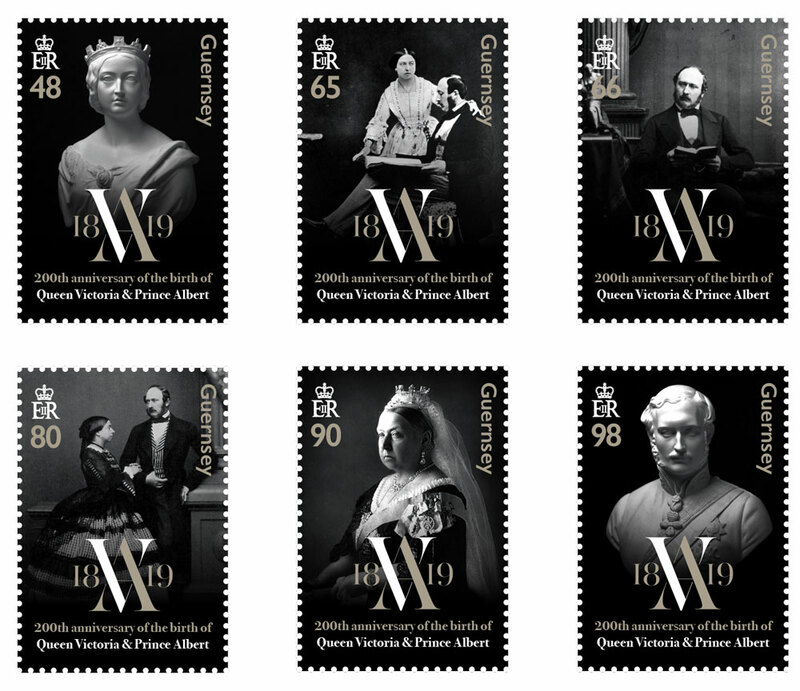 The stamp set, which depicts the royal couple both individually and as a couple, includes the first photograph to depict Queen Victoria as a reigning monarch, which was taken in 1854, along with striking images of their marble busts in white against a rich black background, carved in 1855 by Joseph Durham. Victoria was born at Kensington Palace, London, on 24 May 1819. She was the only daughter of Edward, Duke of Kent, fourth son of George III. Her father died shortly after her birth and she became heir to the throne. On William IV's death in 1837, she became Queen at the age of 18. Prince Albert's uncle, Prince Leopold, hoped that the Prince would marry his cousin Princess Victoria. He arranged their first meeting on 18 May 1836 and, having met again in October 1839, their engagement was announced on 23 November that year. The marriage took place on 10 February 1840 in the Chapel Royal, at St James’s Palace. By the end of 1840, Prince Albert was, in effect, Private Secretary to The Queen. He was granted full access to Cabinet and other State papers, and from 1841 onwards he joined Victoria at audiences held with her ministers. Over the years, overwork took its toll on Prince Albert's health and he died from typhoid fever on 14 December 1861, aged 42, at Windsor Castle with Queen Victoria and five of their nine children at his bedside. Victoria died at Osborne House on the Isle of Wight, on 22 January 1901 after a reign lasting almost 64 years, then the longest in British history. She was buried at Windsor beside Prince Albert, in the Frogmore Royal Mausoleum, which she had built for their final resting place. The stamps are available to pre-order from 13 May 2019 at www.guernseystamps.com or by contacting Philatelic Customer Services on +44 (0)1481 716486.